Found this GREAT and interesting HK article online by accident! Want to know the story behind the "Small gift, big smile" gimmick? Below is case study of the fascination with Hello Kitty and the history behind it's success and failures. Go here to read this Case Study article OR continue to read below. She (Hello Kitty) is the original, and it is hard to replace her. She became the icon of cute for a whole generation. You can’t buy that kind of lucky coincidence. Co-author, Hello Kitty: The Remarkable Story of Sanrio and the Billion Dollar Feline Phenomenon, in 2004. Hello Kitty was propelled from day one by the character’s cute and simple design. After 30 years, we’re glad to see that people are still buying her products. Hello Kitty was born in suburban London on November 1. Her real name is Kitty White. Hello Kitty’s family consisted of her father, George White, mother Mary White and a twin sister, Mimmy. Other family members included Anthony and Mary White, Hello Kitty’s grandfather and grandmother respectively. Sanrio also created several friends for Hello Kitty. In early 2005, Sanrio Co Ltd. (Sanrio), the Japanese company which created the popular cartoon cat Hello Kitty, entered into a licensing agreement with jewelry designer Kimora Lee Simmons’ (Simmons) company, Simmons Jewelry Co., to create a line of diamond jewelry— the “Hello Kitty Collection by Kimora Lee Simmons.” Simmons’ jewelry line, which included pendants, rings, and diamond watches, was priced in the range of $350 to $3,5003, and was launched in March 2005. The diamond watches, which were reportedly the best selling items in the line, were priced between $1,875 and $3,250 and were available in eight different designs. All of Simmons’ jewelry was available exclusively at NeimanMarcus outlets across the US. (Refer to Exhibit I for pictures of some of Simmons’ jewelry pieces). Diamond jewelry was only a small part of the Hello Kitty merchandising universe. The Hello Kitty brand was also used on designer apparel, accessories, and perfumes. High-end pet accessories were sold under the label the “Hello Kitty Collection by Little Lilly” at upscale boutiques in the US. On the technology front, a Japanese company called Business Design Laboratory created a 20-inch tall Hello Kitty robot4 that could perform the job of front-desk personnel in the early 2000s. Apart from luxury products, consumers could also buy affordable products like Hello Kitty pencil boxes, purses, and apparel from various stores worldwide. Reportedly, as of early 2006, there were thousands of different Hello Kitty products available in over 40 countries around the world. Sanrio first introduced Hello Kitty in 1974, as an embellishment on a small coin purse sold by the company. Children, especially small girls, loved the cartoon and the cat became very popular. Keeping the character’s popularity in mind, Sanrio produced several Hello Kitty branded products, aimed at small girls and preteens over the late 1970s. However, during the 1980s, the growing popularity of other cartoon characters such as Doraemon (another cat) resulted in the Hello Kitty brand losing some of its appeal. Therefore, in the mid-1990s, Sanrio repositioned the brand to make it appealing to a wider age range of female customers. The repositioning was successful, and Hello Kitty regained its popularity. Over the years, Sanrio launched the Hello Kitty brand in various countries in Southeast Asia, Europe, and the Americas. In Southeast Asia, analysts noted that girls showed almost a fanatical devotion to the brand. Apart from Southeast Asia, Hello Kitty was also hugely popular in the US—so popular that she was considered to be in the same league as cartoon characters like Mickey Mouse, Snoopy, and Winnie the Pooh. Such was Hello Kitty’s popularity that she was chosen the UNICEF ambassador for the USA in 1983 and for Japan in 1994. By the early 2000s, however, Hello Kitty began facing brand fatigue in its domestic market, Japan. In 2002, Winnie the Pooh replaced Hello Kitty as the best-selling character among female consumers in Japan. This in turn had an impact on Sanrio as Hello Kitty was the company’s main brand and Japan its key market. In the early 2000s, Sanrio was trying to reposition the brand once again by associating it with jewelry and luxury products. Shintaro Tsuji (Tsuji), the founder of Sanrio, was born in 1927 in the Yamanashi region of Japan. Tsuji was an engineering graduate, and worked for the Japanese government before resigning to pursue his entrepreneurial ambitions. Tsuji set up the Yamanashi Silk Center (YSC) in 1960, through which he sold silk goods like purses, slippers, etc.7 However, Tsuji did not find much success in this business initially. In 1962, Tsuji started selling a line of slippers that had the picture of a strawberry on them. These slippers went on to become a huge success and gave a boost to Tsuji’s struggling business. Tsuji realized then that consumers were more attracted to items that had been embellished with some design or character. He was later quoted as saying, “If you attach added value or design to the product, they sell in a completely different way.” After the success of the slippers Tsuji concentrated on developing designs and pictures that could be used to adorn his merchandise. In the meantime, he received a license from Charles Schulz to use the famous Snoopy character on his merchandise. Apart from this, Tsuji also began selling Hallmark greeting cards and Barbie dolls in Japan. However, these products did not find a good market in the country as Japanese consumers considered them to be too “western”. Over a period of time, Tsuji recruited artists to develop characters that could be used to decorate items like key chains, cups, etc. By the end of the 1960s, he had put together an in-house creative team that was responsible for churning out new designs and characters. Tsuji’s intention was to take advantage of the Japanese custom of giving gifts. In Japan, people often exchange small and inexpensive gifts like key chains and other tokens. Even children like to exchange small gifts and small stationery items. Tsuji noted that there was a huge market for merchandise such as pencil boxes, small purses, etc., that young people could afford to buy. In 1973, Tsuji incorporated YSC as Sanrio Co. Ltd. The company adopted the motto “Small Gift, Big Smile, ” implying that a small gift could bring great joy to both the giver as well as the receiver, and that gifts were a form of expressing one’s feelings to another person. Sanrio focused on selling character-branded goods to young people. The company defined its main business as “social communication gift products” or small gifts that were exchanged socially. During the early 1970s, Tsuji and his creative team introduced various characters and designs for use on merchandise. Prominent among these were Patty and Jimmy (cartoon characters of a girl and a boy) and Hello Kitty, in 1974. Hello Kitty became an instant hit with children, who took a liking to the cute cat with the oversized head. Hello Kitty’s sales grew quickly, and this contributed to Sanrio’s success in the 1970s. Soon, Hello Kitty had become so popular that many companies started approaching Sanrio for permission to use the image. In 1976, Sanrio started licensing the Hello Kitty image to various companies for use on their merchandise. Over the years, Sanrio introduced several other popular characters like Chococat, Keroppi, Cinnamoroll, etc., but Hello Kitty remained its most successful character. 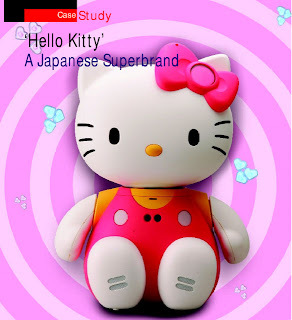 The brand’s success made Sanrio one of the leading companies in the lucrative character branded goods market in Japan. Sanrio also made money by licensing its other cartoon characters to other companies in Japan and worldwide. Apart from marketing character branded goods, Sanrio also produced movies. In 1978, Tsuji received an Academy Award in the “best documentary film” category for the movie Who are the Debolts and Where Did They Get 19 Kids? However, most of the company’s revenues still came from its “social communication businesses” or the sale of characterbranded merchandise. Over the years, Sanrio continued to introduce new cartoon characters at regular intervals while retiring some of the older characters. However, Hello Kitty remained the company’s main brand. (Reportedly, the Hello Kitty brand was providing almost half of Sanrio’s revenues by the early 2000s.) Sanrio opened an amusement park called Puroland in Tokyo, Japan, in 1990. In 1991, the company opened another amusement park called Harmonyland in Oita, Japan. Sanrio’s product range, which comprised mainly stationery items in the 1970s, was extended to a wide array of products including apparel and accessories by the early 2000s (Refer to Exhibit II for Sanrio’s major businesses in early 2006). Over the years, Sanrio launched its characters in various countries mainly through licensing. In 2006, the International Licensing Industry Merchandisers’ Association (LIMA) inducted Tsuji into the Murray Altchuler Licensing Industry Hall of Fame. According to LIMA, Tsuji was recognized for his 30-year career in the licensing industry, during which time he had built up Hello Kitty into a “global licensing phenomenon”. Although Sanrio expanded its overseas market over the years, Japan remained its key market throughout. Tsuji was considered to be the equivalent of Walt Disney in Japan because of the success achieved by Sanrio’s characters in the country and around the world. As of early 2006, Sanrio sold its products in more than 40 countries in Asia, Europe, and the Americas. During the early 1970s, Sanrio carried out a consumer survey which revealed that the most popular cartoon characters in Japan were those of dogs, bears, and cats. Accordingly, the company asked its creative team to develop new characters based on these animals. In 1974, Shimizu Yuko (Shimizu), one of the designers who mainly designed wallets for the company, created several characters including designs for a cat, a dog, and a bear. The design of the cat character was interesting in that it had an oversized round face with two dots as eyes, a button nose, and no mouth. It also had six whiskers and a red bow on its left ear. The cat, like most other cartoon characters, sat in a human-like posture. One of the most striking features of this cat, however, was that its face was completely expressionless (Refer to Exhibit IV for a picture of the first Hello Kitty design). Sanrio first used the cat (which had no name at the time) to decorate a coin purse, which it sold along with other wallets in 1974. Over time, Sanrio observed that the purses featuring the cat were selling better than the others. To make the most of the cat’s popularity, the company decided to give it a solo launch in 1975. Sanrio named the character “Hello Kitty”, and began selling toys, stationery items, and other small gift articles with pictures of Hello Kitty. Explaining the rationale behind the name, Bill Hensley (Hensley), marketing director, Sanrio’s US business, Sanrio Inc.13 said, “Gift-giving is an important part of the Japanese culture. In Japan, ‘Hello’ communicates the idea of open communication. That’s why she was named Hello Kitty.”14 Tsuji initially targeted the Hello Kitty merchandise at girls aged between 4 and 6. The goods were priced low so that they could be bought by the target consumers. Hello Kitty became an instant hit with small girls because of her “cuteness”. As a result, Hello Kitty merchandise began selling well in the market. The fact that the merchandise was priced affordably added to its success. Hello Kitty’s popularity continued to increase throughout the 1970s. Meanwhile, Sanrio launched Hello Kitty and other characters in the US. Here too, the company noticed that Hello Kitty was more popular than its other Sanrio counterparts. However, in the 1980s, Hello Kitty began losing its cachet in Japan, due to the growing popularity of new anime15 characters such as Doraemon. Anime continued to grow in popularity throughout the 1980s and the early 1990s, not only in Japan, but also in other countries (Mainly in Southeast Asia and North America). In the mid-1980s, Sanrio recruited a new designer, Yamaguchi Yuko (Yamaguchi). Yamaguchi was believed to be responsible for extending the Hello Kitty brand to a wide array of items including candy, accessories, clothes, and electronic goods. By this time, Sanrio had begun efforts to make the Hello Kitty brand more attractive to teenaged girls (going beyond its traditional market of small girls) in a bid to revive the fading brand. Reportedly, Sanrio got the idea after a high-school girl wrote a letter to the company in 1986 complaining that it did not produce products for girls of her age. After this, Yamaguchi visited various shops in Japan to find out what customers expected from Hello Kitty. She realized that although the company had positioned Hello Kitty as a character for small girls, the brand’s appeal went far beyond the original target market. Consequently, she convinced the company to take steps to make Hello Kitty acceptable to diverse age groups. She even introduced a sober black and white Hello Kitty design in order to attract older consumers. However, in spite of these efforts, Sanrio was not very successful in reviving the brand. Hello Kitty got a fresh lease of life in the mid-1990s, after Sanrio managed to successfully change the positioning of the brand. This period was called the “Kitty boom” by some industry observers. In 1996, Yamaguchi designed “hip” products like Hello Kitty mobile phone cases, etc., targeted at high-school girls. These products were popular, and sold well. Some analysts, however, believed that Hello Kitty’s revival during this time was the result of several factors, and could not be completely credited to Sanrio. They believed that Hello Kitty experienced a sudden rise in popularity due to the voluntary endorsement of the brand by Tomomi Kahara (Kahara), a young Japanese singer, in the mid-1990s. Kahara, who was very popular with high school girls, proclaimed herself to be a big fan of Hello Kitty, and sported a variety of Hello Kitty products during her public appearances. Said Takahashi Ko (Ko), marketing executive at Sanrio, “Kitty experienced the greatest rise in popularity since her creation thanks to pop singer Kahara Tomomi. She went on the highly rated TV program —Utaban and told the hosts that she loved Kitty-chan more than anything. Within days sales in our outlets had nearly doubled.” Analysts also attributed the popularity of Hello Kitty among teenaged girls in Japan to another fad prevalent in Japan during the mid-1990s — Print Club kiosks18. These kiosks were mainly used by female consumers aged between 13 and 28. Sanrio, spotting a business opportunity, set up Print Club kiosks in its shops. According to the company, young girls who were waiting to use a kiosk browsed around the shop and bought Hello Kitty merchandise. Another reason for Hello Kitty’s revival, according to industry observers, was that young women who had been fans of Hello Kitty in their childhood continued to buy the brand even after they grew up. It was noted that women liked to decorate their office desks with Hello Kitty merchandise. Further, young mothers were buying merchandise for themselves (like toasters, hair curlers, etc.) as well as their children, and Hello Kitty had, by the early 2000s, become a brand that attracted female consumers in the age group of 4 to 30. Interestingly, a “Kitty boom” occurred outside Japan too at this time. During the 1990s, Hello Kitty had become hugely popular in the US and some Southeast Asian countries. Apparently, Hello Kitty’s popularity among celebrities was not restricted to Japan. The brand became a favorite with many celebrities in other Asian and western countries, especially in the US, during the late 1990s. Reportedly, celebrities in the US like singer Christina Aguilera, musician and TV personality Lisa Loeb (Loeb), supermodel Tyra Banks, and singer Mariah Carey (Carey) were big fans of Hello Kitty. Carey made headlines when she showed off her Hello Kitty hair dryer and boom box19 while appearing in an episode of a popular television show, MTV Cribs, in the early 2000s. Loeb, a popular singer in the US, even dedicated an album to Hello Kitty. The album was aptly titled Hello Lisa.20 Many celebrities such as Cameron Diaz, Mandy Moore, Heidi Klum, Carmen Elektra, Nicky Hilton, Ashley Judd, Madonna, and others posed for fashion magazines dressed in outfits with pictures of Hello Kitty and accessories (Refer to Exhibit VI for pictures of celebrities with the Hello Kitty brand). Becoming a “Hollywood favorite” helped Hello Kitty gain visibility worldwide. Sanrio also acted quickly to make the most of this popularity. During the “Kitty boom” the company entered into several licensing agreements and brought out a host of Hello Kitty products. It licensed Hello Kitty for varied products targeted at different consumer groups. While on the one hand, Hello Kitty was featured on small items like pencil boxes for small girls and accessories for highschool girls, there was also a Hello Kitty car targeted at young women. Thanks to voluntary endorsements by celebrities, Hello Kitty had become a fashion symbol by the early 2000s. This allowed Hello Kitty to gain acceptance as a “premium brand” even though the brand was still used by Sanrio and other companies (under license) for small stationery items like pencils and sharpeners. In the early 2000s, the Hello Kitty brand had reached near saturation point in traditional products. Therefore, Sanrio looked for tie-ups with high-end luxury items. The fact that it was voluntarily endorsed by celebrities helped Hello Kitty’s new positioning as a luxury brand. In April 2003, the Hello Kitty brand was used by Heatherette, a fashion label in the US, for its Spring/Summer 2003 collection. Designers Richie Rich and Traver Rains launched a new line of clothing featuring exclusive Hello Kitty designs. Swarovski21 offered a range of Hello Kitty merchandise like watches, jewelry, charms for mobile phones, etc. By this time, there were collectors of unique Hello Kitty merchandise. The items ranged from high-end products like a Hello Kitty watch by Swarovski to limited edition dolls like the Hello Kitty wedding collection by Sanrio. In November 2004, Hello Kitty completed 30 years. It was interesting to note that organizations other than Sanrio were also keen to celebrate Hello Kitty’s 30th “birthday”. For example, the Japan Mint produced 200,000 commemorative coin sets to commemorate the anniversary. Another Japanese company, Tanaka Kikinzoku Kogyo KK, made 12 solid platinum statues worth $30,000 each, and sold all 12. According to analysts, Sanrio’s decision to put Hello Kitty on a wide variety of products was largely responsible for keeping the brand in the public eye for more than three decades. After featuring the cat on a coin purse in 1975, Sanrio had, over the years, branched out to include several other items under the Hello Kitty brand. Analysts commented that Sanrio had put Hello Kitty on practically everything. Only Hello Kitty featured on items ranging from vacuum cleaners to DVD players, toilet paper to cars and computers to candy. Said Bruce Guiliano (Guiliano), senior vice president of licensing, Sanrio Inc., “In Japan, it’s possible to have your entire house decorated and fixturized in Hello Kitty…. There’s even a Hello Kitty dishwasher.” Sanrio was able to feature Hello Kitty on a variety of products through its licensing agreements with companies. For instance, in Japan, toymakers like Takara Co. Ltd. and Bandai Co. Ltd. (Bandai) produced Hello Kitty toys under license from Sanrio. Matsushita Electrical Industrial Co. Ltd. (Matsushita) had the license to make Hello Kitty toasters. Mitsubishi Motor Corp. (Mitsubishi)26 created a prototype “champagne pink” Hello Kitty minicar in 2006. Sanrio also offered Hello Kitty video games and mobile games in association with gaming companies. For instance, in 2006, Sanrio and MOffy, a Hong-Kong based mobile games developer, launched a series of mobile games called Hello Kitty Saves the Beach, Hello Kitty Magic Block, Hello Kitty Amazing Circus, and Hello Kitty Joyful Balloon. It was also through licensing that Sanrio was able to extend the Hello Kitty brand to luxury products. For instance, Daiwa Resort Co. Ltd., a popular hotel chain in Japan, offered Hello Kitty-themed suites to its customers under license from Sanrio. Tarina Tarantino (Tarantino), a famous designer in the US, launched a new line of jewelry called the “Hello Kitty Pink Head Collection” under license from Sanrio. In addition to licensing out the brand, Sanrio also introduced new items of its own every year. (Reportedly, 90% of the creative design team at Sanrio’s headquarters were women. According to some analysts, this went in favor of the company as the designers understood the needs and preferences of the target market well.) Sanrio replaced old Hello Kitty branded merchandise in shops with new items every six months. This kept the merchandise trendy and relevant. Sanrio’s amusement parks Puroland and Harmonyland were “Kittythemed”, and they even offered Hello Kitty-theme weddings. By the early 2000s, Sanrio was introducing close to 100 new designs of Hello Kitty products per month, worldwide. Even though the Hello Kitty brand was used on a range of items, Sanrio took measures to protect the brand’s image from being sullied. For example, Sanrio did not permit companies to use the Hello Kitty brand for three categories of products—alcohol, firearms, and tobacco. Reportedly, Sanrio spent ¥1.5 bn every year on measures against unauthorized copying to control its charactergoods business. It was also worth noting that Sanrio used minimal advertising to promote Hello Kitty. The advertising mostly consisted of print and online advertising, which was primarily created in-house. The company believed that word-of-mouth was more powerful than promoting the product in the media through TV advertisements, movie tie-ins, etc. Said Hensley, “The publicity feeds word-of-mouth better than advertising does, and that word-of-mouth is really what drives the Sanrio experience.” Sanrio, unlike other cartoon companies, did not produce Hello Kitty based comic strips, movies, or TV shows on a regular basis. However, Sanrio actively participated in co-branding and other promotional programs. For instance, in 1999, Sanrio entered into a marketing tie-up with McDonald’s in Taiwan. As a part of the promotional program, McDonald’s gave away a limited edition of Hello Kitty wedding collection dolls with every “Happy Meal”. The campaign was so successful that it led to stampedes and fights among consumers. Reportedly, many fans purchased Happy Meals only to throw them away while keeping the dolls. The limited edition dolls were later sold for thousands of dollars as collectors’ items. In 2005, Sanrio permitted Eva Air, a Taiwanese airline, to decorate some of its aircraft in the Hello Kitty theme. It was said that these flights were booked more than 90% on an average. The carrier also did brisk business in Hello Kitty branded dutyfree goods. In the US, Sanrio worked with some retailers to develop products that met their specific requirements. For instance, Target, a USbased retailer, carried an exclusive line of Hello Kitty merchandise such as party invitations, small inflatable chairs, etc. Target even had a special Hello Kitty princess costume consisting of a Kitty-themed dress, wand, footwear, etc. By the early 2000s, the Hello Kitty was recognized in more than 40 countries in Asia, Europe, and the Americas. Hello Kitty was believed to be one of the most successful commercial images in the world. What Made Hello Kitty Click? Is Hello Kitty Losing Her Charm? Even though Hello Kitty was still among the top-selling brands in Japan as of early 2006, the avenues for future growth seemed limited. The increasing popularity of Winnie the Pooh among female consumers prompted analysts to say that Hello Kitty’s cachet was at risk in Japan. Analysts noted that Sanrio had succeeded in reviving the brand in the 1990s by repositioning Hello Kitty to make her appealing to a larger number of people. However, they were doubtful if the company could pull off the same trick a second time. There were several reasons for this. Hello Kitty had already been placed on a wide range of items and there were few new items left. Further, a demographic shift was taking place in Japan, with the number of young people decreasing over the years owing to low birth rates. This in turn limited sales as Sanrio’s target consumers were young people. Also, as the character-goods business in Japan had its roots in the Kawaii culture, brands like Hello Kitty and others were expected to lose their appeal once the culture died out in the country. Apart from these problems, analysts also opined that Sanrio could soon face succession problems. Tsuji, who was largely acknowledged to be the driving force behind the company’s growth, had turned 78 in 2005, and it was thought that his eventual exit would create a leadership vacuum in Sanrio. According to analysts, Sanrio’s financial performance was also likely to suffer as a result of Hello Kitty’s decreasing popularity. This was because the brand contributed almost half of the company’s revenues. “It’s needless to say that Kitty is Sanrio’s most powerful product, their fortune,” said Kazuo Rikukawa, president, Character Databank. Adding to Sanrio’s woes was the fact that it had been making losses in the amusement park business and was relying heavily on its social communication business. Sanrio had been increasingly focusing on the overseas market to improve the revenues from the Hello Kitty brand. “In Japan, Hello Kitty is a mature brand, even though it has seen substantial growth over the years,” said Hensley. He also said, “Our biggest market for her is still Japan and Southeast Asia, but our big push going forward is the Western hemisphere, primarily the US market.” Sanrio also appointed Mas Imai, a former Disney executive, as president and chief operating officer of Sanrio Inc. in 2005 in order to lead Sanrio’s US operations. Sanrio continued with its licensing strategy, bringing out a variety of Hello Kitty products like a guitar, a credit card, etc., in the US. In October 2004, the company started offering co-branded debit cards in association with MasterCard Inc. targeted at girls aged between 10 and 14. In the same month, it entered into an agreement with Nokia, a major mobile phone manufacturer, and Cingular Wireless, a service provider to offer Hello Kitty mobile phones. In 2006, Sanrio and Fender Musical Instruments Corp. launched a guitar called “Hello Kitty Stratocaster”. The guitar was priced at $229 and was sold on the company’s website and at participating Sanrio boutiques in the US. By 2005-06, Hello Kitty was undergoing another image overhaul in a bid to attract older consumers. As of early 2006, the Hello Kitty brand was used on a variety of luxury goods that were available at high-end retailers like Neiman-Marcus, Saks Fifth Avenue, etc., in the US. Sanrio’s target customers for Hello Kitty in the US mainly consisted of Asian and Hispanic consumers. But in 2005-06 Sanrio was trying to target female consumers belonging to all age groups, and all ethnic and cultural groups. Said Giuliano, “Hello Kitty is finding increasing acceptance as (a) symbolic icon of feminine style and taste.” However, it remained to be seen whether Sanrio’s extensive licensing of the Hello Kitty brand would add to the brand’s value or dilute it. SS George Director, The Icfai Center for Management Research (ICMR), Hyderabad. The author can be reached at ssgeorge@icfai.org Shirisha Regani Faculty Associate, The Icfai Center for Management Research (ICMR), Hyderabad. The author can be reached at shirisharegani@icmr.icfai.com Smitha Moganty Former Research Associate, The Icfai Center for Management Research (ICMR), Hyderabad.